Vacation rental house. Sleeps 4, 1 bedroom, 1 bathroom. No pets allowed. Welcome to a very special destination named Nami-An. This is a distinctive home you will come to cherish like few others. Contemporary architecture with a Japanese influence creates a tranquil destination. Enjoy fantastic views overlooking the water and neighboring islands. This beautiful pocket beach with tide pools to explore is in front of the property. Welcome inside! 18' ceilings add light and volume in the living area. You'll find a futon and separate folding mattress in the open loft. The sleek, contemporary design creates an incredibly peaceful feeling in the home that extends outdoors. Bamboo flooring and paperstone counters are among the eco friendly choices for finishings. 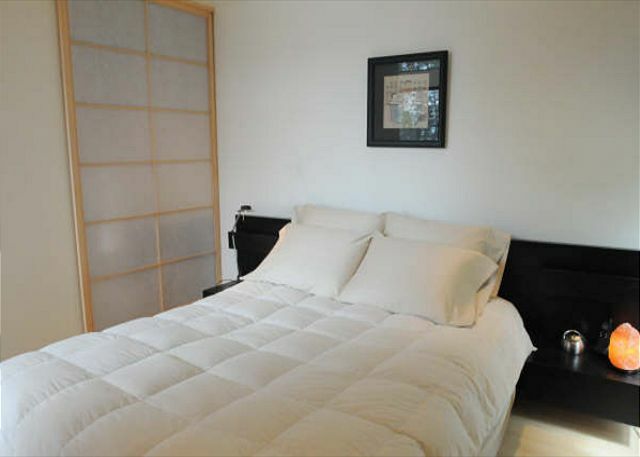 A shoji screen provides privacy for the lower level bedroom with queen size bed. A soothing indoor/outdoor experience awaits when you clamber into this deep soaking tub. Take your pick of shower - indoors or out, both on Ipe flooring. A shoji screen provides privacy for the bathers. You'll find sleek furnishings and bamboo flooring on both levels of Nami An. The loft looks over the Strait. Shoji screens slide across the railing for visual privacy from below. Here is the view from the loft looking down. Read more about Nami An's design and construction in Achitectural Daily. We really hope you will consider booking Nami-An for your next vacation. Here is a last shot of the beach where you will find incredible 180 degree views of the water, islands, and distant mountains. 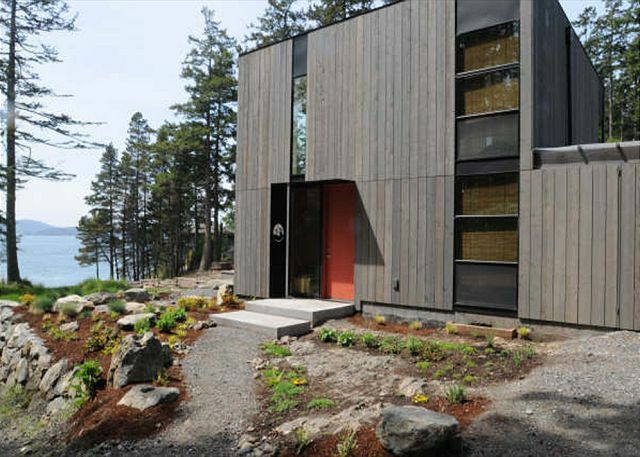 When your tastes run to the contemporary, you’ll find this sophisticated Doe Bay cabin a jewel of design integrity (To learn about the architect's concept, go to www.archdaily/157449 - Nami an is the featured property!) Nami An has a distinctive minimal esthetic with Asian influences. This "cabin" on Doe Bay is a light-filled volume of space, created with the vision that every detail should be precise and harmonious. The Asian theme begins when you remove your shoes and don slippers (thoughtfully provided) to tread lightly on the bamboo floors. Furnishings are sleek and contemporary; shoji screens take the place of swinging doors. Bathing is a special experience as well - you’ll step up to sink down into a deep Japanese soaking tub. One side of the shower is a glass wall with a view into a small fenced garden.There’s even an outdoor shower in this courtyard where you can feel completely part of the natural atmosphere. Nami An has a beautiful waterfront outlook where nature abounds. Complete privacy is provided to the left of the home by a wooded area that attracts deer, eagles, and rabbits. The two neighboring homes to the right may be screened from view with the use of window shades and shoji screens. Forward of the home, there is a cleared path that leads to a rocky outcrop at the shoreline. When the water recedes in low tide, you can clamber along the waterside and study the wide diversity of sea creatures left behind in the pockets of the rocks. Nami An has a great location on the sunny southeastern tip of Orcas Island, within a short walk of Doe Bay Resort where there's a convenience store, a wonderful restaurant, and clothing optional soaking tubs and sauna (a day pass can be purchased at the Resort). It's a 15 minute drive to Olga and Moran State Park (super hiking! ), about 30 minutes from Eastsound Village where there are lots of shops and dining, and a 45 minute drive from the Orcas Ferry Landing. Please note that this home is not suitable for children under 12 years of age. Netflix is available through the Blue Ray DVD player. The Blue-Ray DVD player will recognize and play regular DVDs as well as CDs all through the stereo set up. The internet provider is "Doe Bay Internet User's Association" It provides a very quick and dependable connection. • Travel Insurance – Unexpected Things Can Happen, We Highly Recommend You Purchase Travel Insurance. Northwest Island Escapes makes every effort to provide, and provide timely maintenance and service for, all the amenities listed in this property description. However, at times, due to events out of our control, these services may not be as fast or reliable as our guests are used to on the mainland. Please Read your contract for important additional information about the availability of these services. We stayed at Nami-An for 5 days. We loved the location and the house is beautiful. We had impeccable views and watching the deer and seals was lovely. The home is in need of some touch ups. The beds are uncomfortable and in need of new mattresses. There is a queen and a full size so if you are accustomed to a bigger bed, there will be adjustment. There are also missing screens in the upstairs loft which are intended to provide light filtration so the upstairs sleeping area is quite bright, we were unable to use it. There are other items on the property in need of repair but they did not effect our stay. The kitchen is well appointed and the home is very close to Doe Bay Resort which has an amazing restaurant and spa facilities as well as a small general store. We just spent a peaceful, 5 days in " Nami-an" attending a workshop at Doe Bay. The setting was pristine as well as the house, with Asian soaking tub and immaculate bamboo floors. We slept in the loft and woke every morning to views of the sound. Ended our day sitting on the rocks watching the seals. Magical! We plan to return soon. We had a great trip! We had a wonderful time on Orcas and loved the house - it is very beautiful and open, with an incredible view. The power went out on Orcas due to a wind storm one day, but the wood burning stove kept very toasty! We can’t wait to come back. The home is lovely and all that we expected. Other than close neighbor (I would extend the blocking panel about 6 feet), it is a wonderful place to relax, take in the long views and more. This is a special part of the island, quiet and peaceful. Doe Bay resort serves wonderful meals but you can cook here to you hearts delight...which we did, shellfish from buckbay! The only thing that would be good is a screen to cover the 8 foot opening...just in evening so the bugs don't come in with your lights on. Thanks and we will be back! PS, gas was out on grill, but one phone call and Erica was over to change...Thanks! The home is as described and very beautiful. Views are incredible and unobstructed. The home is very well equipped and maintained. Quiet neighborhood. Just wonderful. We'll be back. Water access is a scramble over boulders; great for tide-pooling, but not possible to put in a kayak. Access to the beach is difficult. Nami An was beautiful and serene. The view is spectacular, especially from the cliffs in front of the house. The home is small - best suited for a couple or small family - but it's well equipped. Nami An is on Doe Bay, which is about half an hour from Eastsound (groceries, restaurants, etc.). One note: Currently (July 2017), there's construction going on next door. We heard it only on the day we left, but it was noisy. Prospective renters may want to check with the property managers as to the status. Very well-maintained place in a wonderfully remote location. VRBO/HomeAway made the logistics easy. Home was immaculate and nicely supplied. Hard to imagine improving on it. A stunning home in a quiet location was everything we were looking for in a getaway! There were heavy storms predicted and the management company called us to make sure we were OK with still going. We decided to go and hunker down with books, movies and wine! Sadly, we packed many DVD's and there was only a BluRay player. This was a pretty big set back as we really wanted to take this time to catch up on movies. Don't pack your CD's either. If you DO have BluRay's, then you are set with what seems to be a great audio system. The TV monitor is oddly placed, so you will have to move some furniture around to watch comfortably. Great pot bellied stove, view, soaking tub, beds, linens and so much more. Unfortunately, when we arrived, the house had not been cleaned and really wasn't habitable. Kyle, the agent, arranged to have a woman partially clean the house so that we could at least sleep there, and take a shower in the morning. She finished cleaning the next day when we were out. Aside from that, the house itself is beautiful, full of light, highly functional, and has a gorgeous view. It's perfectly situated on the lot. I can't say enough good things about the house. Really perfection itself. of the house when we arrived. However, it WAS rectified, and from then on, we had a lovely vacation. that was already included in the entire price. The house was clean, spacious and unique. Loved the view and seeing the deer in the yard each morning. Really great! Beautiful views - great architecture. Our only criticism would be the impracticability of the bathroom. The master bedroom always had to go downstairs to use it and the shower - although highly aesthetic - really wasn't functional. Small but wonderful house with Japanese inspired decor. Right up our alley! Clean and relaxing place to recharge, we enjoyed our stay vet much and the location is very nice and rural, their is a neighbor next door but we didn't mind. I am hopeful to return next year. It was really hard to leave the house to go sightseeing but we managed. Orcas island is as beautiful on top of the mountain as the Amalfi coast! Our stay at Nami-an was just as magical as it looked in the photos. Yes, there are neighbors close by, but the house is a work of art and the wall of glass framed spectacular and changing views throughout our trip. Depending on your plans, the house might be a little bit out of the way - it's a 30 minute or so drive to the main town (Eastsound) and a 45 minute trip to the ferry. There are fantastic things to do nearby, though – we enjoyed meals at nearby Doe Bay Resort and Rosario Resort, and Moran State Park is a quick drive away. We did grocery shopping in Eastsound and enjoyed several meals at home on the grill, eating outside to the sound of the waves on our own private space. I never got bored of sitting on the deck or on the rocks by the water, watching the sky and the wildlife. What a wonderful retreat! Thanks for sharing it with us! I would also add that the property management company was extremely helpful and responsive throughout our planning, during our stay, and after our stay. I really appreciated that too! The secluded location with private beach made for the perfect get away. The owners attention to the essentials was much appreciated. The cleanest rental I have ever stayed in. The soaking tube was a real treat. Can't wait to return. This has to be one of the best places on Orcas for an intimate waterfront getaway - simple, pristine and all about the stunning sea view and light that fills the space through that giant window. About 10 minutes drive to great hikes in Moran, 20 minutes to Eastsound. Neighbors are very close-by but the house is so thoughtfully sited you really don't notice them. Great sound system - bring your i-pod loaded with a zen playlist and bliss out. This home far exceeded my expectations. The views from every room are amazing. Every amenity is available, the beds and linens are comfortable. Everything was impeccably clean. I loved practicing yoga on the deck at sunrise with a view of the bay. Only wish we had spent more time at the house. Can't wait to get back. A week in paradise. We loved this place. Had a little difficulties with the housekeeping. But the management solved our problem very soon and professional. Whale watching was great experience. First trip no orcas. Next trip the other day was for free!! And yes we saw 12 of these wonderful animals. We definitely come back to this wonderful place. A beautiful house in a perfect setting. Rental property was immaculate, modern and beautiful. It's in a very quiet, remote, and secluded part of Orcas Island, which does take some time to get to from the ferry terminal on Orcas. However, it is well worth it. Property has an amazing water view and the Two story windows make it even better. Best shower I have ever used. when showering, it seems you are outside, but really not, which is perfect IMHO. I found it to be private. Internet was a bit slow, but met expectations for this type of remote vacation. Speaker system wired throughout house is playing via smartphone. Plenty of room for 4 with a single shared bathroom. House has everything you would ever need. property manager is obviously very good because we ran in to NO issues. Loved this amazing vacation. Things we did- whale watching (we were in the middle of a 50 whale Superpod), mountain biking, hiking, raw oyster shucking down the street, and more. would return in a heartbeat and I seriously will be considering putting a similar bathroom in my house. Unit is priced right for the value in the summer. The home is very tastefully done and offers all amenities one would think of for a vacation plus some. The view from the house are breath taking and for a city dweller it was amazing to be so close to deer every day. It's a short walk to Doe Bay and the wonderful Doe Bay Cafe, that has great dinner and wine selections. It's located almost at the very furthest away point from the ferry landing. Stayed a week in this unique, Japanese inspired house to finish a writing assignment. Beautiful view and within easy walking distance of the Doe Bay baths and cafe. Minimalist design with everything you need for a getaway. We cannot say enough good things about Nami-an, it was definitely one of our better vacation rental experiences. The home is minimal but comfortable and it provided everything we needed for our 4-night stay. We loved the view, the deer that grazed on the meadow, the deck, the comfortable (but small) bed, and we especially enjoyed the Japanese soaking tub and outdoor shower. We had visions of hiking and going out for dinner, but once we arrived, we were so content in the house we only ventured out for short strolls to Doe Bay Resort or down to the water. Instead of getting out and about, we chose to soak up every possible minute relaxing in the home's serene atmosphere. While I don't think this modern and minimal retreat is for everybody, it suited us perfectly for this getaway that was meant solely for R & R. The home's lack of knick knacks and clutter truly allowed us to unwind and relax and just be. Yes, the neighbors are close, but unless you really want a remote and solitary place, the nearby homes were never an issue. We had the home to ourselves (married couple) and while there are two rooms with beds, there is not a lot of privacy and we would not want to stay here with another couple. This was a delightful anniversary getaway for us and we will definitely be back. It was a fun vacation with much hiking and canoeing. The place was nice and clean with simple nice design. The view was great and the coast outside our home was rocky. Many deer are seen around the home and the island. We had no problems occur during our stay. It was a great place to stay. We thoroughly enjoyed 9 days in this specially designed small home facing south on the Sound. The 'unique' Japanese-style design adds wonderful character to the experience: clean, compact, lovely blond bamboos. And fully equipped modern kitchen and bath (with Japanese added features like the small enclosed garden off the shower/tub room) -- in perfect working order. Per the photos, we truly enjoyed the light and openness of the wall-to-wall, floor-to-ceiling windows In good weather, we used the deck a lot. Comfy chairs inside and out. Comfy beds in the enclosed bedroom, and in the very large 'open loft' which we preferred for ourselves -- giving the closed room to 3 sets of family couples who joined us in succession --- and appreciated the home and setting as much as we did. Note there's space for 4 with the understanding that 'doors' are sliding Japanese screens offering somewhat reduced 'privacy' for sound. The photos don't show the neighbor's homes on the contiguous land -- one visible in the field of vision of 'our' home. Not a problem for us, but it 'breaks' the feeling of seclusion and wild forest on the other side and the splendid views down to the water, across the trimmed grass and low wild bush. We enjoyed views from the rocks, but didn't even try the descent to the rocky 'beach' that emerged at low tide. Loved the 4-5 deer who dined daily on the lawn. Buck's Cove for oysters, clams & crab, eat picnic-style there, or take home with their salmon and occasional prawns. Garden-fresh veggies. Nice views. Doe Bay Café a 10-minute walk away -- great breakfasts and lunches, excellent setting. Moran State Park is a beaut: views from Mt top, 4 mile walk around Mt. Lake, stroll to the falls. East Sound we like: good arts/crafts, fab bakery, Madrona Cafe, supermarket, etc. Overall - a wonderful experience & home base on our favorite San Juan isles. Highly recommended. The home was beautiful along with the amazing view. It was a treat for my wife and I to stay here; it was so different from our home. It is decorated in Japanese minimalist theme. My wife enjoyed the soaking tub. We do wish there was more privacy; the home next door is very close and the blinds to do block out the view if the lights are in the house. We loved sitting out on the deck enjoying the morning coffee, but the home next doors living room over looks this property. We really wish there was a screen for more privacy on the deck. All and all this home is wonderful and is perfect for a couple's get away. We have missed it for the past two weeks with vacation withdraws. From the design to the location to the thoughtfulness of the owners (leaving us Tea and Firewood, Nami-An was ideal. Our two children loved waking up to the loft level view of the water, we really enjoyed the deck and location as well. All were impressed by the traditional (and modern) Japanese bath, and virtually every day was acommpanied by deer, eagles and tremendous views as we drove between doe bay and eastsound. Having the Doe Bay Cafe for some really top notch meals and cocktails was also a big plus. Really could not have been more ideal. The only thing wrong with this rental is that it's not available year-round :) Thanks again for a brief but enjoyable stay. Nami An was fabulous! It is right next to Doe Bay with a great restaurant and sea kayaking. East Sound is about 25 minutes away. The island is wonderful and the house is very peaceful. We would definitely return! If you plan to hang out in the Doe Bay area, this is a fabulous spot. Otherwise, be prepared to drive to other Orcas locations since this is at the furthest end of the island. For us, the 15 minutes from the Moran State Park trailheads was VERY enjoyable. We loved being able to walk to the Doe Bay resort for food and kayaking. My wife and I had such a relaxing time at Nami-an! The location is incredible, and nothing beats drinking coffee on the porch in the morning, wrapped in a blanket, watching deer graze and bald eagles fly amongst the trees. There is a house very close next door, so the place is not completely secluded, but this was not a problem for us at all. Definitely one of the best vacations we have ever had! Great place to stay for a weekend getaway! Loved the modern architecture, floor to ceiling windows, and big soaking tub (which takes almost all the hot water to fill). Quiet and peaceful setting with a nice deck to enjoy view. It's 15 min from Eastsound, but close to Doe Bay Cafe, Cafe Olga, and Buckbay Shellfish Farm (the oysters were delicious). We arrived late. It was very dark and a light was not left on for us. We had a flashlight in our car and liked the simple code on the lock box because of our level of frustration at trying to find this out of way spot in the dark. Once inside and lights on we relaxed. The bed was very comfy so had a good nights rest and woke up to our surroundings. We were delighted by the glass doors opening up to the outdoors. And that view! We found the drive to the stores not an issue and also brunched at Doe Bay which was a highlight. Our stay included a birthday with our daughter and it was fun to be able to relax with her at Nami-an and have her stay over with us.We took full advantage of the access to the water taking our morning coffee to sit on the rocks and watch the sunrise. My husband had to be in touch with his work and appreciated the wifi connection. All in all it was a great and calm stay (except for our arrival) Maybe suggest people arrive in daylight when possible if they are new to the site. My favourite thing about this place was the access to the outdoor surroundings and the shower! Everything about the house is lovely, and it presents a walkway down to a rock above the beach where we sat with morning coffee and evening ale and watched a school of porpoises lobtailing. Renters should know that there are neighbors very close by; the photographs do not show this, and we felt, initially, that we had been misled. Also, the Doe Bay festival was on during our visit, which meant the noise level was much higher than we bargained for. Nevertheless, we enjoyed the location. We had a daily herd of deer that grazed in front of the house; eagles flew by, and plenty of interesting seabirds for us to learn about swam in the channel. Ultimately house itself is so peaceful that you find you don't notice the neighbors, or mind the festival (which was itself peaceable, and silenced by 10 PM). We especially loved the Japanese bath; we recommend trying it! Doe Bay is lovely; location near Eastsound was great. Wonderful view from rental. Two other residences very close. Compact home as generally described in rental info, very clean, nice linens and towels; comfort somewhat compromised by small spaces and sparse furnishings. Overall, worked well for us for our short but terrific stay on Orcas Island. Would recommend to others, but with caveat about uniqueness. If you like the idea of a smaller "Jewel House" where everything is just perfect, this is the house. For two people it's great. We found it very, very relaxing and fun to stay in, and we enjoyed the area where it located. We loved Orcas Island, and this house and we expect to return! It's a great rental. Clean, huge windows, amazing views, awesome RAIS wood stove. It's a big bare. There is no place to really lounge around, but that's also consistent with the modern/minimalist design and Japanese influence. It's a beautiful modern cabin, for simple easy living. We enjoyed our stay very much. As a matter of fact, I'd like to have a house like that. Is there any way of finding out who constructed it? Good eye! Nami An has been featured in numerous architectural articles, we'll see that you receive information. So happy to hear you had a great time on Orcas! So glad you enjoyed your vacation at Nami An! Just a note about the market - in addition to the primary grocery in Eastsound, there is a small convenience market within a short walk at Doe Bay as well as at Rosario Resort. Great location. Great house - well appointed, cool vibe. The weather was less than perfect during our stay, but we enjoyed it nonetheless, thanks to the beautiful views which could be enjoyed from any room in the house. The kitchen is well stocked if you want to cook in and Doe Bay Resort Cafe is just a meander down the road if you don't. An 11:00 am checkout time would have made our departure less rushed (doing and putting away the dishes, gathering garbage, packing etc. took some time), but we made it out at 10:01 on the dot. We plan to return next summer, if we can. Great - we hope to see you then! We left some suggestions on the table at the property regarding amenities it would have been nice to have on site. An exquisitely designed vacation home on Doe Bay overlooking Rosario Strait with keen attention to detail and the essential pleasures of island living. Home San Juan Island Vacation Rentals Orcas Island Vacation Rentals Lopez Island Vacation Rentals .